McCarthy, Betsy, “Knit Socks! : 15 Cool Patterns for Toasty Feet,” Storey Publishing, 2004. I wrote Knit Socks! to extend the community of sock knitters beyond those I could support directly through classes. I especially wanted to reach knitters who didn’t have opportunities to take classes so they, too, could join the tribe. And join they did After six printings there are 70,000 books in print. Knit Socks! clearly and simply walks knitters through the traditional top-down sock knitting process: turning the heel, closing the toes and ultimately caring for beautiful handknit socks. The book is written for double pointed needles. It is an excellent book for beginners or knitters who have been intimidated by the idea of making socks. Additionally, the book has something for everyone. There are patterns of increasing levels of difficulty that enable sock knitters to sample slip stitch, lace and stranded 2-color patterns. My favorite patterns are those that look more complex than they are–socks that make great social knitting. Knitters of all experience levels will find patterns they love in this book. McCarthy, Betsy. “Knit Socks! 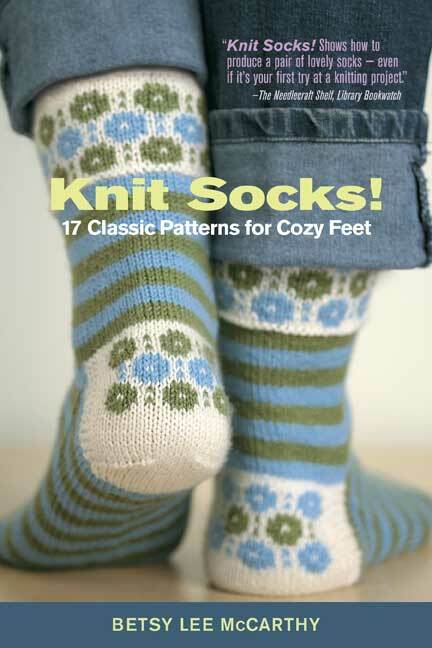 17 Classic Patterns for Cozy Feet,” Storey Publishing, 2010. I was pleased to be asked to revise and add material to my original “Knit Socks!” book. After six printings (70,000 copies) my publisher, Storey Publishing, wanted to re-issue the book as part of their classic offerings which are intended to stay in print for a long time. I love being a part of the Storey Publishing family with their commitment to publish practical information that encourages “personal independence in harmony with the environment.” Who could argue with that—-certainly not me! Initially I thought that a “revised, re-issued” version of that book would basically involve me re-introducing the material and adding more helpful hints and information. As it turned out, this was very far from what happened. I ended up re-writing much of the explanatory and introductory material so that it included instructions and illustrations for knitting socks with any needle configuration: double points, 2 circulars or 1 long circular needle. I updated yarns and sock models for the favorite classic socks, replacing discontinued yarns with yarns currently available. I revised patterns to make it easier for knitters to use circular needles. New patterns were added, and all of the new ones have several variations that result in there actually being 8 new sock patterns available in the revised edition. I am very pleased with the final results of the new book that will be released in September, 2010. I look forward to reaching and supporting more sock knitters through this book. Knitting socks is such a joy, simple and meditative once one becomes comfortable with the process. But more about them at another time. Rebecca Skloot, “The Immortal Life of Henrietta Lacks,” Crown, 2010. I would be the last person on earth to be able to review objectively a book that my daughter dedicated ten years of her life to writing. I will say, however, that Becka’s perseverance and strengths as an adult, such as to never take “no” for an answer when she wanted a “yes,” were qualities I observed in her since she was a child. So, I am not surprised that she stuck with this project, despite numerous challenges, until she was able to write the book she needed to write in the way it needed to be written. After reading the manuscript in progress at many stages, I still love it and am in awe of the hard work, sensitivity, insight and artistry that went into its creation. Its ranking on the nonfiction New York Times bestseller’s list speaks for itself, as well the many positive reviews in newspapers, journals, radio and television. 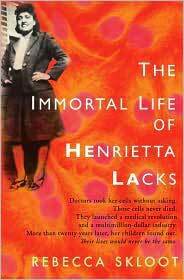 It’s a significant accomplishment and a great vehicle for bringing visilibility to the contributions made by Henrietta Lacks’ immortal cells and the scientific developments that followed. I am proud of my daughter and the Lacks family. My daughter skillfully weaves together so many different threads in the book: ethical, legal, medical, historical, racial, narrative, and personal, which make it a rich reading experience. And she is a knitter, too ! An unabridged audio book is available including an interview with the author–if any of you knitters like to “read” while knitting. i think i’ll look for the book . thanks for sharing ! I just found your blog, thanks to Kristin Nicholas, and have had a great time reading through. I look forward to more! I am downloading your daughter’s book right now from Audible. Thanks for that. I have heard so much about this book and wanted to read it. Having it as an audiobook is so great as I love to listen to books while knitting. I also look forward to the re-release of your sock book – yay, more socks! Hi Julie, Glad you enjoyed the blog. There will be more and hopefully fairly often. Right now, I’m finishing up the final, final ms review of the revised book. I think you’ll enjoy Becka’s book—-she’s gotten such wonderful review and I think it’s now #2 on nonfiction NYT list. This morning she was interviewed in a feature segment on CBS News World Reports, yesterday on Michael Feldman’s “What Do You Know?” (can find on Wisconsin public radio, 3/13/10, segment #1), and strangely enough, this coming Tuesday night she will be interviewed by Steven Colbert on his show! All of this is wonderful but almost surreal! Julie, I love the clock on your blog—-it’s wonderful. Is there somewhere on the web that a blogger can go to find things like this? I am really a beginner. Thanks. I just got back to read your message this morning. I’m a newbie in blogging too and saw these clocks on someone else’s blog. You can choose from a ton of them on clocklink.com. Could you send me a link to Rebecca’s blog and email address? I finished listening to her book yesterday and want to write her. It is an amazing and fascinating book – I soaked up every word. Were you worried about her when she visited the family at all? Or did she tell you about it all after the fact (as my daughter would probably have done). I thought I responded to your comment but haven’t been able to find it. Becka can be followed on her website: http://www.rebeccaskloot.com and also on her blog http://www.scienceblogs.com/culturedish. I’ve read her book probably nine times in as many years and each time loved it more. I tried to read it as an “average reader” but it’s hard when you’re the author’s mother! I’m very proud of her accomplishment—it’s been on the NYT best seller list of nonfiction books for several weeks nowq. And I’ve heard from so many people who didn’t expect the book to be so gripping as they usually didn’t read nonfiction books of this type. I’m very glad you enjoyed it, Julie!